they remind me of my engagement pics! AMAZING dress! 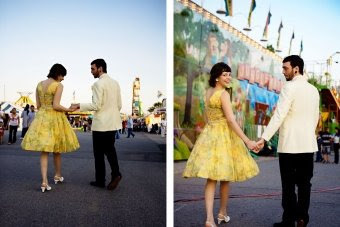 I think I'll let the man wear a white suit (he's channeling kanye) and I'll get a fab, colorful vintage party dress like this! I'd be interested to see if you run across any bride that's gotten a kind of standard wedding dress but then altered it, dyed it, done something to it to make it wearable outside of a wedding. That's what I'd like to do, because I think buying an expensive dress and wearing it once is pretty ridiculous. At the same time, I really want to wear a somewhat princessy dress that day, and then I could remake the dress and wear it on our anniversary and or whenever I darn well please, and have a wonderful reminder of our special day. I think what this bride did was pretty awesome, but I'd like to take another route with the dilemma. Thanks for your great work on this blog. I look forward to practicing the principles you've outlined when it comes time to planning my wedding. Oh my, I would love to find a how-to on revamping/tailoring a wedding dress for everyday wear! That would really be dress-specific. The more obvious changes to make would be shortening it, removing the train, and eliminating some of the layers of tulle (if the dress has these). Some dresses can be converted into sleek column gowns, while others would make better fluffy party dresses. If the bodice has a lot of fussy detailing, sometimes pieces of it can be removed or recolored or replaced. Some dresses look great with sleeves added or removed or altered. Corset-back lacing can be replaced with a different color tie, or the entire closure could be redone in a different style. You might decide to only keep the bodice or only keep the lower part of the dress recognizably intact, and make something entirely new for the other half. Add embroidery. Selectively distress a fussy style. Dip-dye the skirt, dye the whole dress, or give it a patchwork look. I haven't come across many pictures of modified dresses online, but I occasionally stumble across someone describing their post-wedding dress modifications. It's done by someone out there! isn't that dress just the cutest?! love it. posted it on my blog today too!! I'm actually having my dress custom-made (I'm 5'11" and it was a nightmare trying to find a dress), plus it ended up being more affordable for me to have it made, believe it or not.